Grilled beets combine with sautéed Swiss chard and a maple vinaigrette for a flavorful side dish recipe. Read ahead for details, or click here to jump down to the recipe. For a long time, beets were on a very short list of vegetables that I didn’t like. Bad memories of long boiled beets probably had something to do with it. When Jodi and I decided to make a pot of beet soup together early in my cooking days, that only served to conjure up bad memories of those boiled beets. Then I discovered grilled beets. Participating in a CSA (Community Supported Agriculture) where you get a weekly box of whatever veggies a local farmer has in abundance is a great way to try new vegetables. Inevitably you get a lot of beets here in New England so I was determined to give them another try. I found grilling beets brings out their natural sweetness. I will happily eat grilled beets as a side dish without too much adornment. But then we have this recipe for grilled beets, where we double down on the natural sweetness of the beets by tossing them with a bit of our delicious maple vinaigrette. We serve those tasty grilled beets along with some sautéed Chard for a dish with all kinds of great nutrition and flavor. Pinot Noir pairs nicely with grilled beets. You can also serve it with a Gamay, such as a Cru Beaujolais. 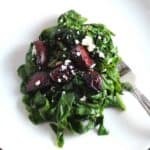 Given those pairing combinations, this grilled beet recipe makes a great side dish for chicken or salmon, which also well with Pinot. I consider this grilled beets recipe a side dish, but you could certainly make a good vegetarian meal of this grilled beets recipe along with quinoa or some other hearty grain. 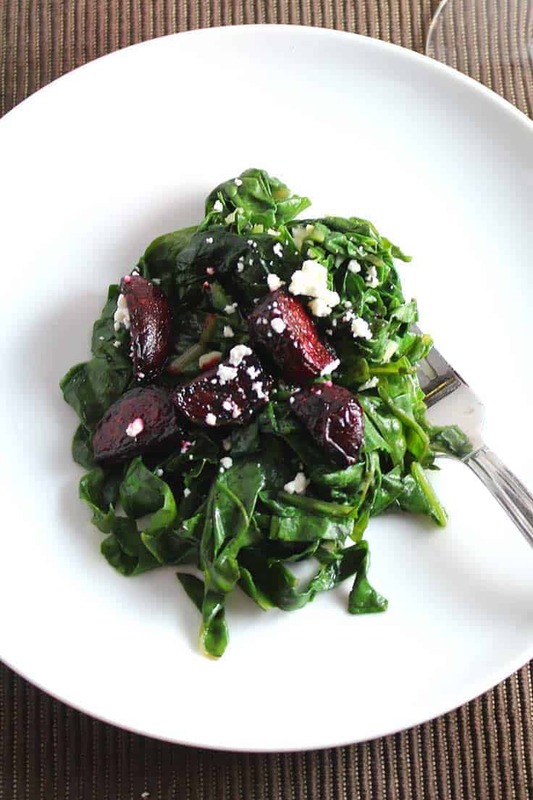 Grilled beets combined with sautéed Swiss chard and a maple vinaigrette for a flavorful side dish recipe. Make the vinaigrette: combine the syrup, olive oil, soy sauce and vinegar in bowl. Whisk in the mustard. Add salt and pepper to taste, set aside. Preheat a grill, leaving the back burner off. Toss the chopped beets with 1 tablespoon olive oil and salt. Spread the beets into a grill pan, and place onto the grill’s direct heat portion. Grill for 5 minutes on one side, then turn the beet pieces over to grill the other side. After 10 minutes of direct heat, move the pan to the back of the grill to roast on indirect heat for another 10 minutes or so until the beets are soft. Remove the beets from the grill and toss with 2 tablespoons of the dressing. Heat the olive oil in a skillet on medium, then add the garlic. Cook for a minute or so until the garlic starts to get fragrant. Gradually stir in the chard. The chard needs about 5 minutes of sautéing, with occasional stirring, to get cooked down and tender. 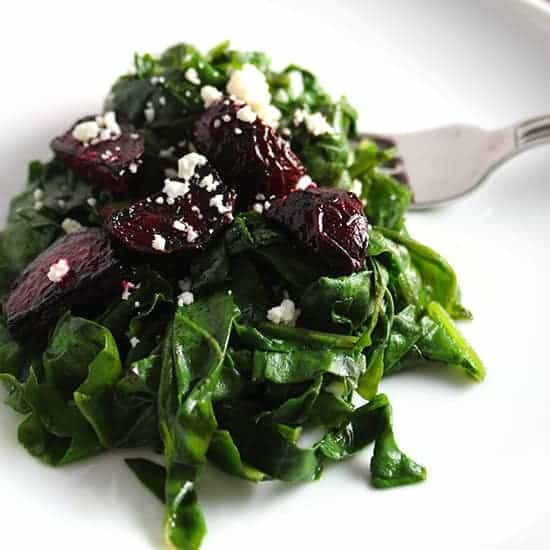 When the chard has cooked, toss it together in a large bowl with the beets and 1 additional tablespoon of the maple vinaigrette. Plate the dish with a sprinkling of feta cheese on top. This looks perfect for lunch today! I’m a recent beet convert. Grilling adds a nice twist to just roasting . I pinned it. Thanks! Thanks Kevin. I do like roasting them too but would say I like grilling best. maybe grilled will be the trick for you, too, Catherine! beet lover raises her hand…. but has never grilled them. brilliant! will have to try before summer ends. if you like beets you should definitely enjoy this! This is a great dish! I’ve never tried grilling beets — must change that! Love the chard and vinaigrette! Hi! Love the idea of grilling the beets for added flavor! And your maple vinaigrette sounds so yummy! !